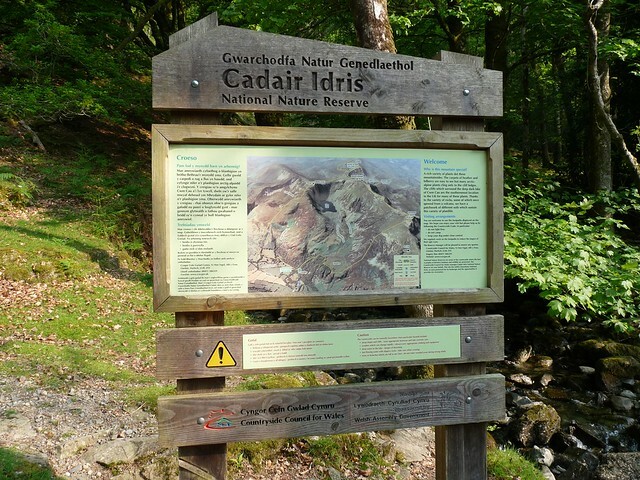 One of the main objectives of our long weekend away over Easter was to finally climb Cadair Idris. Sitting at 893 meters high it's not the tallest mountain in the UK, or even in Wales for that matter, but it is one of the most beautiful and one of the most difficult. My history on this mountain stretches back at least fifteen years to my first, and so far only, successful attempt at its slopes. It was a hot summers day and I convinced my parents to push on to the summit long after they had intended to turn around and head back. 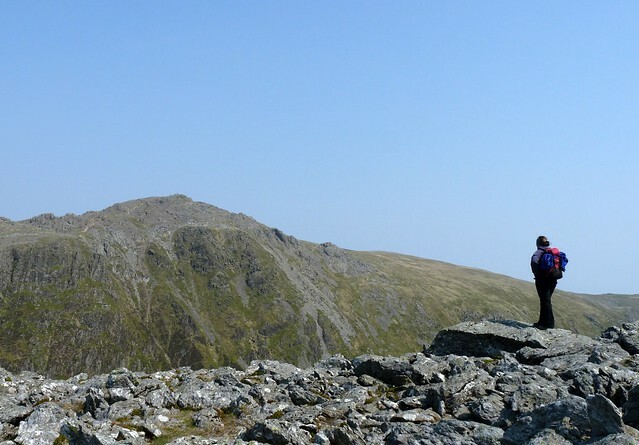 I can remember the excitement of wanting to climb a real mountain for the first time and the amazing views that we got from the top. Ever since I have wanted to go back, but with the exception of a weather aborted attempt in 2006 I hadn't had the chance. Until now. We turned up bright and early at the Minffordd car park (in my opinion the only way from which this mountain should be climbed) in the hope of beating the crowds and any incoming weather systems that may have been developing. We scored well on both points. 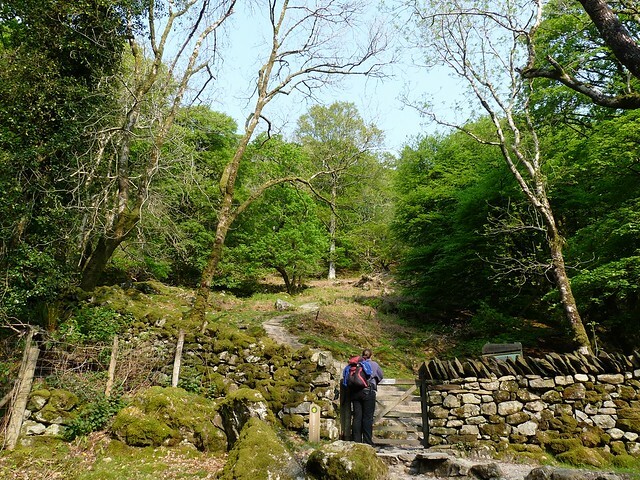 The first part of the climb involves passing through mature woodland alongside the Nant Cadair and its impressive waterfalls. The path here is steep and rocky but man made steps have made the going relatively easy, if tiring. The trees were alive with the sound of Willow Warblers, Chiffchaff and Goldfinches, while next to the water we spotted our first Grey Wagtail of the year. Another 150 meters up and the woodland starts to thin and open up into the valley that makes this place so spectacular (above). At this point the final destination is still out of sight around the corner but the anticipation is growing. 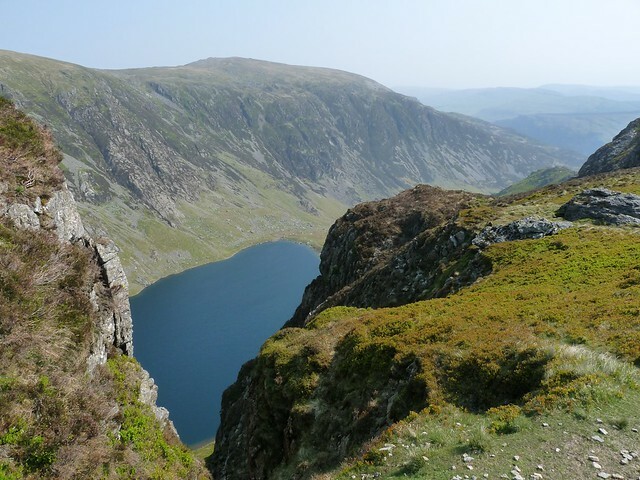 Fifteen minutes more walking and the expanse of Llyn Cau opens up before you. Formed in the hollow of rock scooped out by a glacier, legend has it that spending a night by its water will find yourself awakening as a madman. An ominously empty tent erected on its shores didn't do much to dispel the myth! Llyn Cau is the point at which most people turn back as from here on the paths are much rougher, steeper and looser underfoot. Falls and deaths are not uncommon so its pays to keep your wits about you. The route we were walking takes you up the left hand side of the above photo and along the top of the rim to the peak on the right. Believe me when I say its even more spectacular than it looks here, with every step revealing a new vista across the lake and the valley beyond. Along the way several ancient cairns mark the main path and from experience I can tell you that they are very useful in the fog. 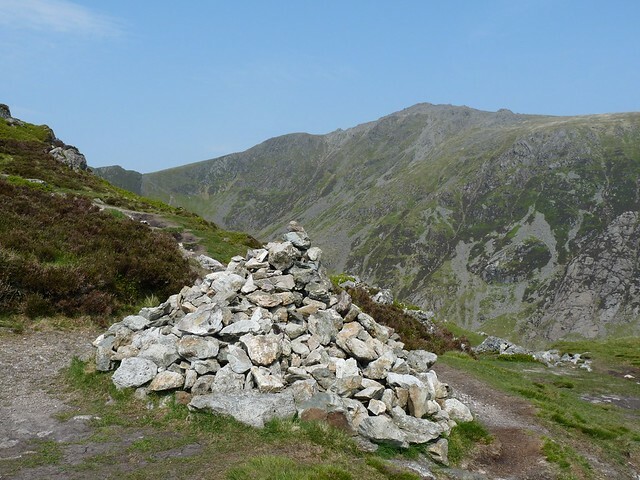 The view above shows one of the largest on the Craig Cwm Amarch ridge, looking across to our goal and the highest peak in the range, Penygadair. By the time we had reached 660 meters the haze that had plagued most of our days away was starting to develop once again. What you can't tell from the photos is that the wind was also growing considerably in strength. Strong gusts would frequently try and grab your leg away from you mid step, just to make those slopes a little bit more daunting. 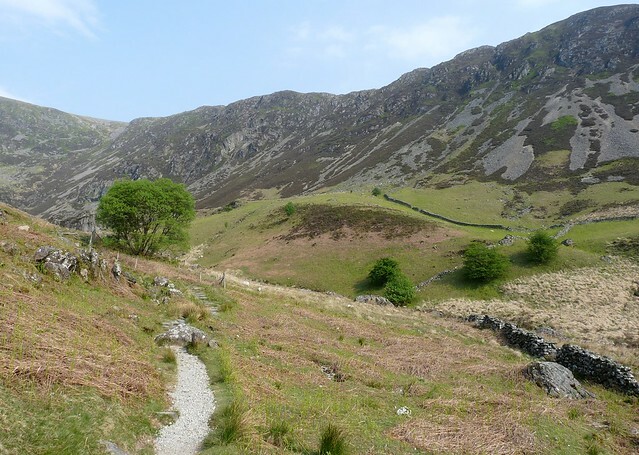 It was around this time that a fell runner raced past us, rather putting our efforts to shame. The fact that he went up and down twice during the time that we went up and down once is simply insane! Another hundred meters up and we were finally at the top of Craig Cau, the second highest peak on the mountain, standing tall at 791 meters. I remember this point of the journey well from when I was a child as originally I had believed it to be the peak of Cadair Idris itself. You can imagine my disappointment when I looked across to see Penygadair towering above us. I think my girlfriend was experiencing a similar set of emotions in the photo below. This time however I knew better and in part two we will make that final ascent. oh, look at that glorious heart-shaped lake in that middle photo! what a beautiful area! An adventure in paradise! I'm totally stunned by those photos! It brings back the thrill of setting eyes on Loch Coruisk in its cleft in the Cuillin for the first time. You now just need to spend a night up there. texwisgirl - I hadn't notice the shape until you mentioned that! It's a fantastic place. Amila - Glad you enjoyed them. Caroline - I'll have to look that Loch up as I haven't been there yet. Andrew - Thanks for the info and your kind comment. I hadn't realised that there was a second part to the legend. A 'real' adventure Adam. Breathtaking views.